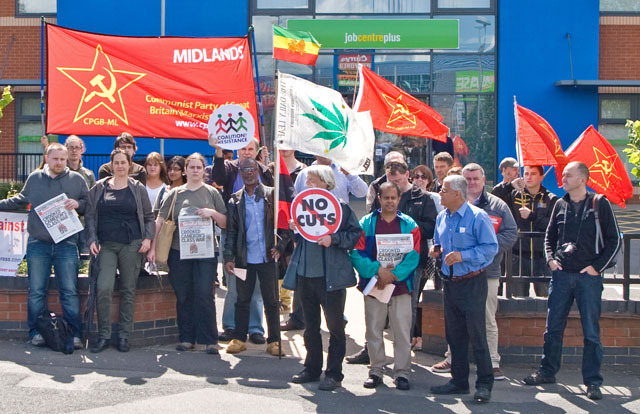 On Saturday 20 December the CPGB-ML and Red Youth held a public meeting in Birmingham to celebrate the successes of the Korean revolution and reaffirm our solidarity with the Korean people in their stand against imperialism. We were joined by two representatives of the DPRK embassy, who among other things informed us about the progress made since the death of Kim Jong Il three years ago — numerous housing, infrastructure and recreational projects have been completed over the past few years. It is clear that despite setbacks and continued imperialist threats and blockade, the Korean people remain determined to build a prosperous socialist country. A representative from Red Youth also read out our message to the Kim Il Sung Socialist Youth League, which is reproduced below, and after the meeting our members got to chat with our Korean comrades over some food and drink. Red Youth send our warm greetings and a militant red salute to comrades of the Kim Il Sung Socialist Youth League on the occasion of the third anniversary of the passing away of comrade Kim Jong Il. 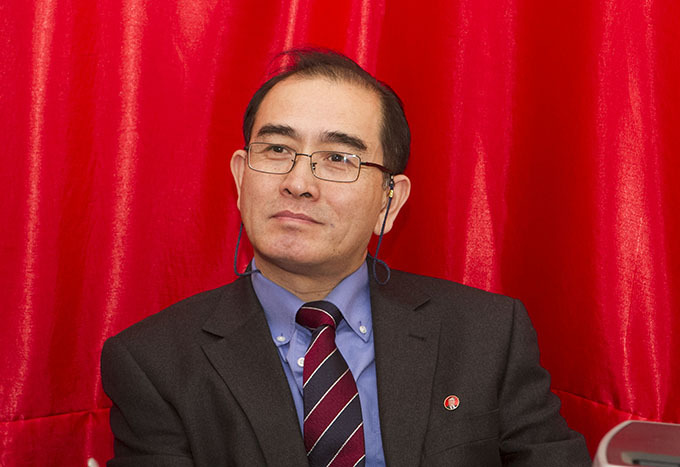 It is with great sorrow that we remember the loss of one of Korea’s finest sons and loyal pupil of comrade Kim Il Sung. But it also gives us the chance to remember the astounding achievements made by the Korean people under the leadership of the Worker’s Party of Korea, guided during extremely dark and difficult times by comrade Kim Jong Il. After the successful liberation and socialist reconstruction of Korea under comrade Kim Il Sung, the Workers Party of Korea and the Korean masses continued to wage a brave fight against imperialism and comrade Kim Jong Il was in the front line. Of particular importance in the DPRK’s ongoing struggle against imperialist aggression and interference was the development of its nuclear deterrent – a crowning achievement of Democratic Korea’s scientific progress. The importance of the DPRK’s nuclear capability has been clearly demonstrated by world events in recent years; with US and NATO imperialists invading, bombing and seeking to subjugate those nations who dare to stand up to imperialisms plunder of the world – Afghanistan, Iraq, Libya and Syria are just the latest victims of imperialisms destructive deeds. 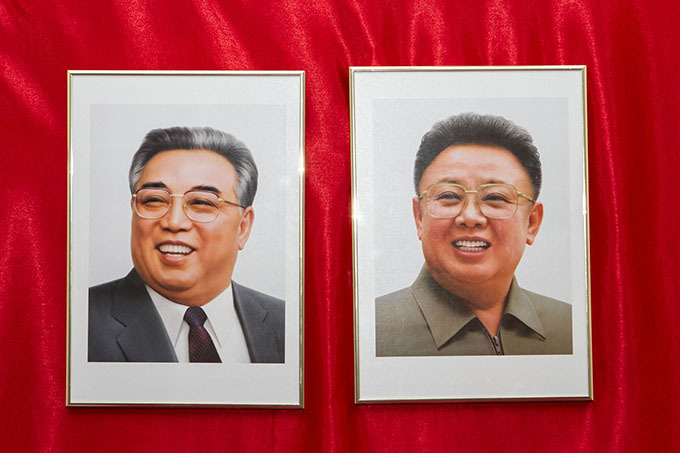 Kim Jong Il’s leadership in the period following the collapse of the USSR and in conditions of a resurgent imperialist offensive proved to be correct. The Korean People’s Army has proven to be a capable defender of socialist Korea’s sovereignty and the freedom of the Korean people. Without a doubt the imperialists will not dare to raise a hand against the DPR Korea, fearful as they should be of a strong rebuke. Today, thanks to comrade Kim Jong Il’s guidance, the DPR Korea stands as a beacon of hope in a world that has seen two decades of unbridled imperialist aggression. It proves to the people of the world that imperialism is a paper tiger, that it can be defeated by the effort of the world’s oppressed people and that a future free of exploitation, misery and war is possible. Comrade Kim Jong Il is an especially shining example to the youth – not only the youth of Korea but the world over, including the revolutionary minded youth in Britain. Like his father before him, comrade Kim Jong Il became politically active at an early age and dedicated his whole life to serving his people and greatly contributing to the global struggle against imperialism. 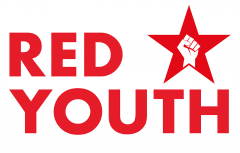 Red Youth will always support the right of the youth and the masses to determine their own future, free from imperialist interference, and we take inspiration from the struggle to build a unified socialist country. In our drive to educate the youth of this country in the science of Marxism Leninism, we also do what we can to counter the lies spread by the imperialist media to the people of Britain. Little by little our people too are starting to see through the veiled imperialist propaganda, to reckon with the double standards and hypocrisy of “our” ruling class. Red Youth will continue to educate our members on the history and present day reality of Korea, teach them about the achievements of the Korean masses led by the Worker’s Party of Korea and explain how they represent the victories of progressive humanity as a whole! The history of the DPRK is living proof that workers and peasants can overthrow their oppressors, seize power and take control of their lives. Imperialism is a decaying system; it is ready to be placed in the museum of antiquities. Socialism is alive and well today thanks to the Korean people’s ongoing efforts and represents the future of all humanity! Long live the fraternal relations between Red Youth and Kim Il Sung Socialist Youth League! Glory to the memory of Kim Jong Il! 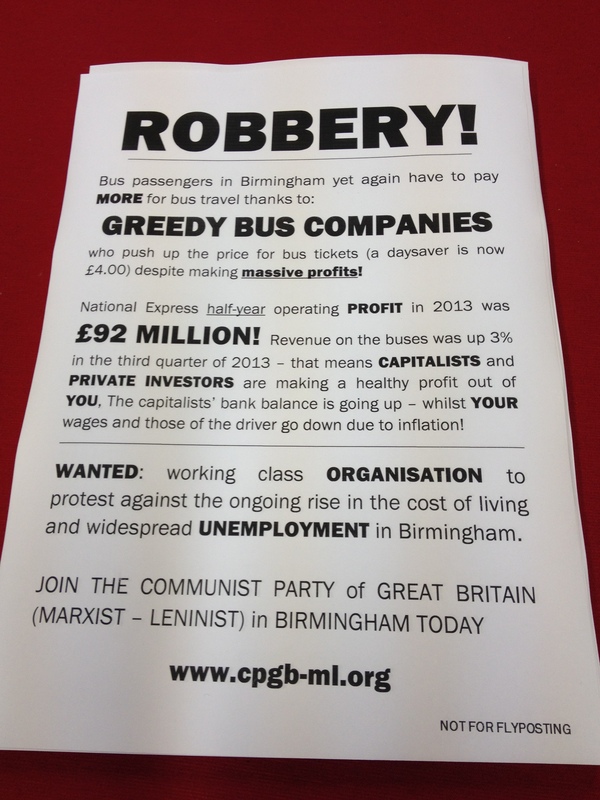 Birmingham Communist Party has begun the new year with a campaign highlighting the massive profits which are being made by local bus operator National Express at a time when Birmingham has some of the most deprived communities in the country who can ill afford another increase. Despite making profits of £92million in just the first six months of 2013, National Express continue to put up the prices across the board for passengers. 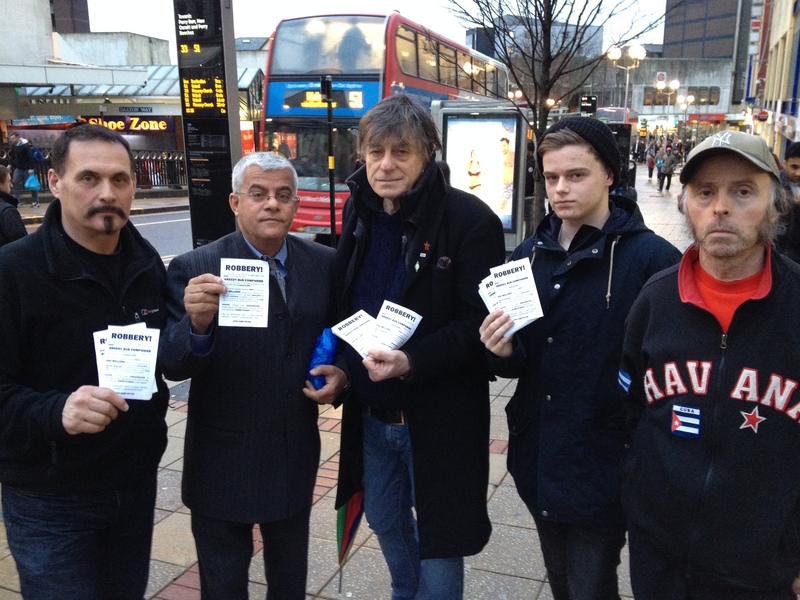 As a prelude to a sustained campaign comrades began the year with a spot of leafleting and spent the day chatting to passengers in the town center and distributing some leaflets which highlighted the gross extortion which is taking place and the need for working class organisation to oppose it. In a number of wards in Birmingham official unemployment is well over 10% and illness and diseases such as TB which were for many years nearly eradicated are making a comeback. Social housing is in a dire state; damp, dank, rotted and crowded flats and houses are surrounded on all sides by streets that are plagued by rats, especially in the inner-city areas of Sparkbrook, Balsall Heath, Highgate and Small Heath where the problem is even worse than it is in Handsworth and other deprived working class areas. This is the reality for hundreds of thousands of residents who live in neglected and semi-derelict properties and streets with the connivance of local Labour Party Councillors who continue to push through cuts to services. Spiraling costs of travel are just one further problem and the numbers of youth who are being forced to skip fares and travel on outdated tickets is leading to an increased presence of heavy policing on the bus routes as the old bill step in to help the bus companies enforce their profiteering (yet another example of the police being mainly concerned with protecting the interests of business). 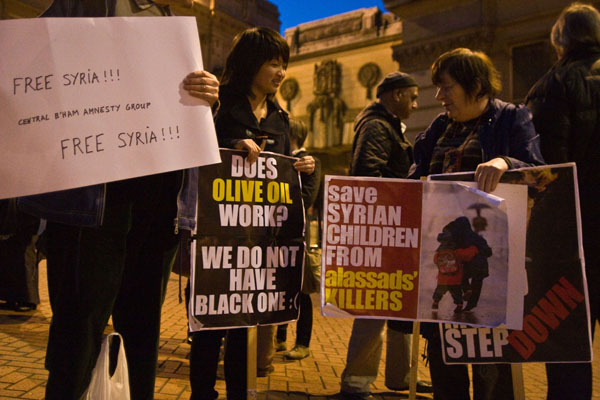 Of course for the “usual suspects” who play the role of the Birmingham “Left” the real issues for workers are making sure the British imperialists invade and slaughter Ba’athists in Syria, and when they’re not spending their week doing that they’re gossiping with other troto-revisionist octogenarians at the trades council. 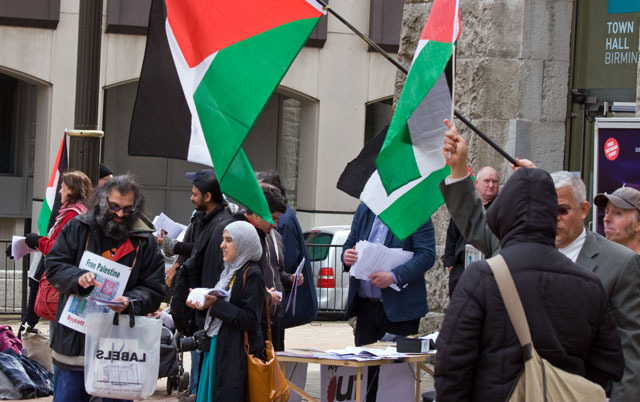 What Birmingham needs is a number of campaigns on issues that affect the working class, led by people not poisoned with the debilitating effects of trotskyism or social democracy. We’ve already got a stinking Labour council and no matter what the Morning Star says we don’t want any more of these “socialist” cuts! Labour, Tory same old story. Fight the cuts, all the cuts! Expose and target the robbers and scroungers; National Express, Starbucks, Poundland! 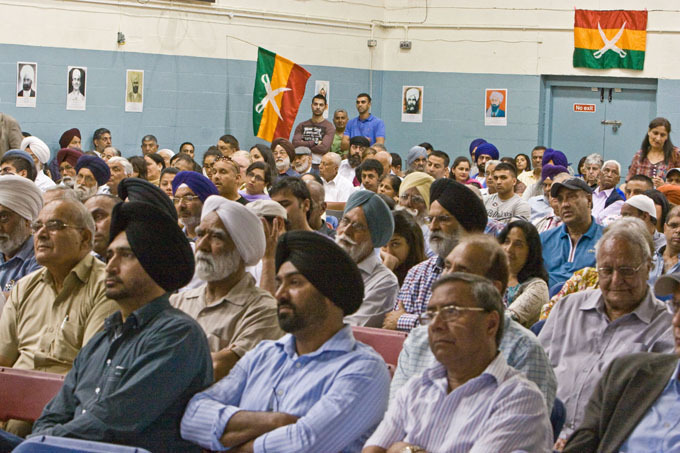 A packed meeting in Handsworth, Birmingham remembered the sacrifice of those who took up arms against British imperialism for freedom, independence and liberty. 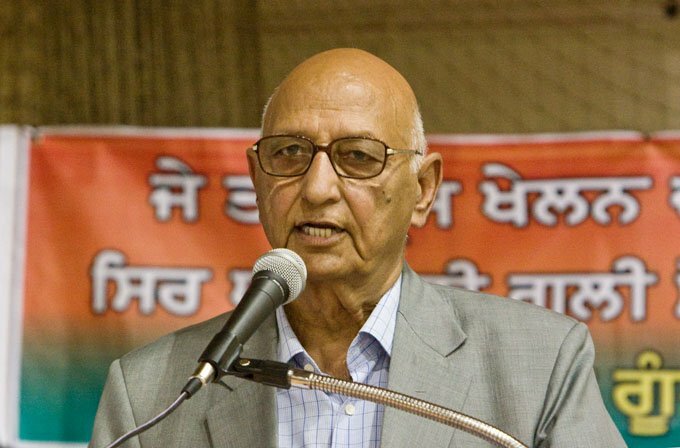 About 300 people came to the hall to hear speeches from Birmingham and Sandwell Indian Workers Association (GB) President Harbahjan Dardi, Secretary Sheera Jouhl, IWA(GB) General Secretary and CPGB-ML cadre Avtar Jouhl and CPGB-ML Chairman Harpal Brar and others. Cultural performances and songs performed by Bhagwant, Virdee and other talented performers finished an excellent afternoon of celebration. 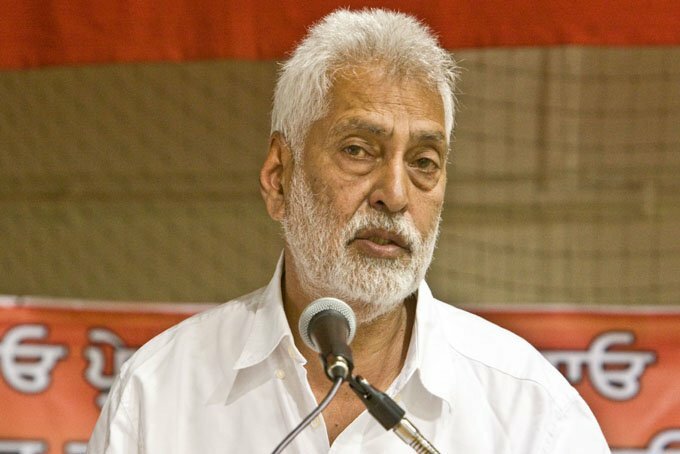 The meeting received a message of greetings from the Socialist Labour Party General Secretary and the full speech of comrade Harpal will be available here shortly. Congratulations must go to Birmingham and Sandwell branch of the IWA and all the family for an inspiring afternoon remembering and honouring these braves sons and daughters of India and flowers of the international proletariat. 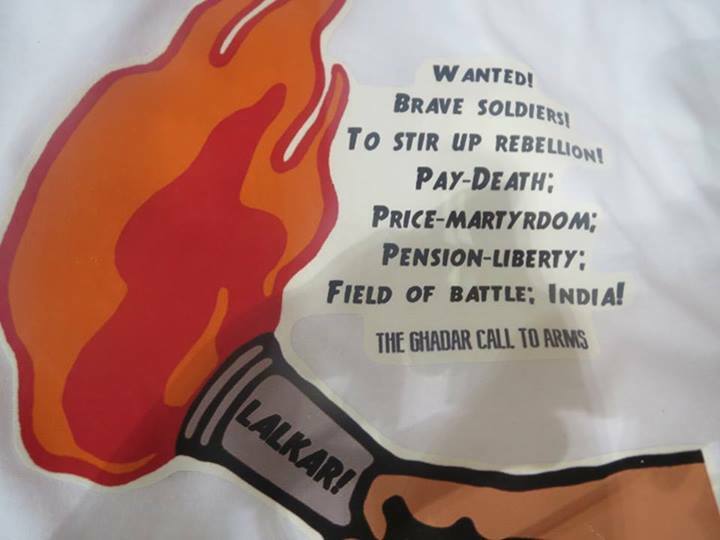 Inquilab Zindabad! “A man has set himself on fire outside a Birmingham jobcentre after what reports suggest was an argument over benefit payments. The 48-year-old unnamed man is understood to have doused himself in flammable liquid and tied himself to railings after a dispute inside the Jobcentre Plus in the Selly Oak area on Thursday. Police arrived at the scene and extinguished the fire after the jobcentre was evacuated. The man was later taken to hospital with burns to his legs. Whilst the imperialist media here in the UK is usually quick to praise such acts of self immolation when undertaken by reactionaries, fascists and medievalists in Tiananmen Square – our Police have decided that this individual needs a mental health assessment – and no doubt they’ll be quick to have him sectioned and away from the media spotlight! Its quite clear to us at Red Youth that it is this system of monopoly parasitism which needs to be treated urgently. An understanding of society (theory) and a way of uniting to change it (organisation) are the two things that we need to make the change necessary so that people aren’t driven to such acts of desperation. We need socialism now! Young people have everything to gain by getting involved in this process sooner rather than later. This world isn’t working for us and we deserve better! Not only do we need to campaign against the bad conditions and lack of prospects for the youth in Britain today, but we need to work for a completely different type of society – one where people’s needs decide everything. So many problems face this world: environmental catastrophe, poverty, disease, racism and war. They’ll never be solved while capitalism remains, but they could all be sorted if society was set up for the benefit of the majority rather than the private gain of a few billionaires. Studying Marxism, organising the young people in your area and learning about how we fight for socialism is the only way we can defeat the ruling class.